"When I come back through that door, I'm still going to be champion of the world." This trailer is worth a watch. Studiocanal UK has unveiled the first UK trailer for Journeyman, the new film written & directed by English actor Paddy Considine (he last directed the acclaimed Tyrannosaur in 2011). 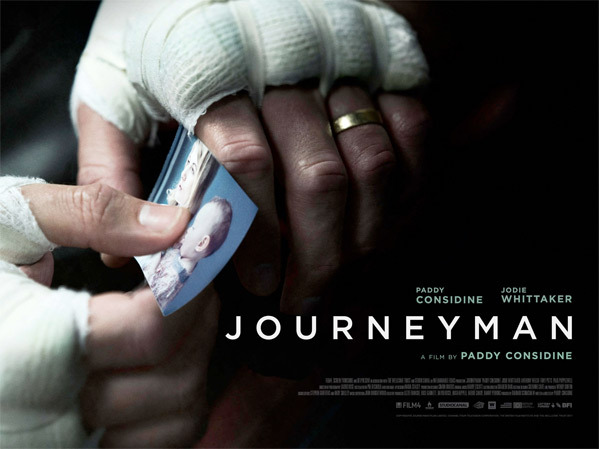 Journeyman tells the story of a world champion boxer named Matty Burton, also played by Paddy Considine, who struggles with life after a head injury that leaves him almost completely debilitated. The cast includes Jodie Whittaker as his wife, along with Paul Popplewell, Tony Pitts, and Anthony Welsh and others. This premiered at the London Film Festival, where I first saw it and wrote a glowing review of the film. As you can see with this trailer, it's not so much about boxing as it is about the struggle of mental illness. See below. Matty Burton (Considine) is the middleweight boxing champion of the world. Now, coming towards the end of his career, he knows that he must make his money and get out of the game. His aim is to secure a home with his wife Emma, and a future for their baby daughter Mia. After a titanic battle against Andre 'The Future' Bryte, Matty returns home to Emma, but moments later collapses on the living room floor from a delayed reaction to a devastating punch. When Matty awakes from the coma, the real fight begins. Suffering from memory loss and with his personality altered, Matty must begin to piece his life back together as his world disintegrates. Journeyman is both written and directed by English actor-filmmaker Paddy Considine, director of Tyrannosaur previously. This premiered at the 2017 London Film Festival. Journeyman opens in the UK starting on February 16th, 2018, but doesn't have a US date set. Thoughts?